My 50th “From the painting desk” entry is another pirate – so no huge departure from what I’ve been doing for the past years. I was thinking of doing something special for the 50th post in the series (namely, featuring a dragon I painted recently), but life intervened so here we are! It’s a privateer from Black Scorpion. There’s really not much difference between a privateer and a pirate (and many swung between the two), so he’s a lovely fit. I love the model’s posing and general look, as he gives off a great stone-cold killer vibe. 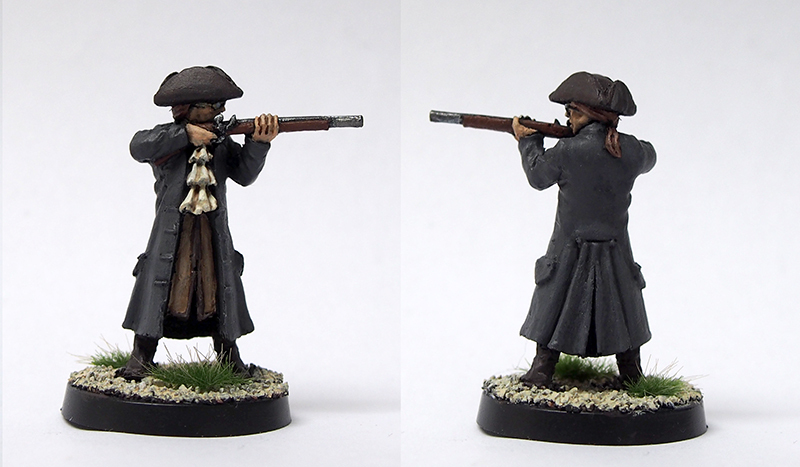 I’m planning to branch out into highwaymen at some point, and he’ll fit right in. Again, I kept the palette toned down and gave the base the “pirate tufts” instead of the flowery ones used on civilians and soldiers. I’m not sure if it shows, but I used the model to practice blending. While I’m happy enough with my level of painting skill, I’ve not noticed much progress in the past years. With this in mind, I’ve begun to consciously learn new stuff – starting from something as elementary as blending. I’m quite happy with the result, and it feels nice to level up my painting a little. Work on this will continue! My pirates will be taking on Paul’s samurai soon, so I’m currently painting up more pirates with muskets to teach him a lesson. As for the pirate’s name, he has spectacles. It’s obvious he’s a doctor, rather than a dubious marksman. I think this is miniature #7 of the year, counting the dragon. I’m quite happy with my output here in Dublin so far, so this might actually be a fairly productive painting year! Nice one man. I was actually thinking he looked like a highwayman before I read it. Be sure to post the battle report when you teach those self righteous Samurai a lesson. Haha. Lookin’ good dude, and nice work on the blending! Thanks Alex! It’s such a simple thing I can’t believe I haven’t stumbled upon it earlier – it simply consists of blending the edge of the highlight and the base colour with a 50/50 mix of said colours. I’ve always done this using a wash or a glaze, but the new techique seems to result in smoother transitions. Looking very good indeed. The black coat is especially well done and still reads as black. To be honest, it’s a very dark grey 😀 Then again, there’s a fine line. I’m also pretty happy to hear that it reads as black, as I’m struggling with highlighting black. I might go for the very very dark grey approach the next time I’m doing black. I tried it with blue and brown. Both work to some extend, but I often end up overdoing it with the blue a bit ;).